EDIT: I TALKED TO THE REPRESENTATIVE AND SHE EXPLAINED ME THAT THE SMARTER ULTRA LOW + NEXETRA LIBRARIES ARE UNSTRANDED. I GUESS ITS THE SAME FOR FLUIDIGM USING THE SMARTER PROTOCOL. THANKS. I am little confused with what option to use for rna-stradness when aligning scRNA-seq data. I have two different dataset, one prepared using SMARTer ultralow RNA protocol and second using Fludigm-mRNA seq method. 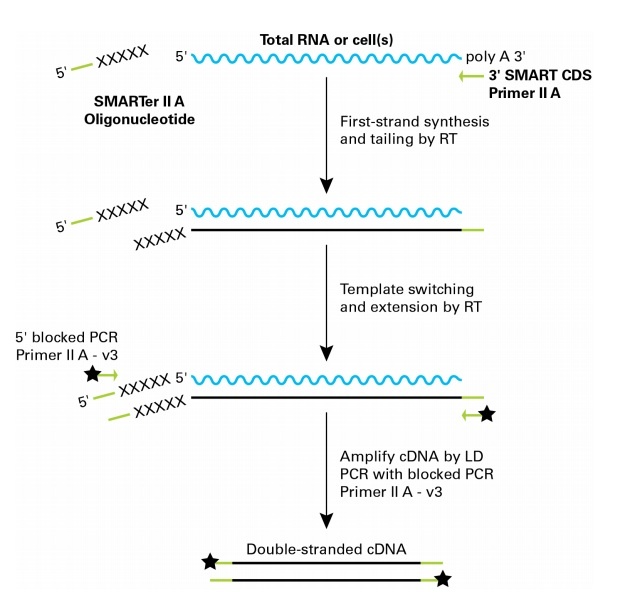 In both method, I see first strand being synthesized first and than the second strand, but as an input for Nextera it suggest the double stranded cDNA is used. Could you help me figure out what rna-stradness opton shall I use for HISAT2:RF (firststrand) or FR? I guess yes firststrand (RF) sounds the one to use then. Yeah. The tech mentioned that "Stranded" libraries preps have "stranded" mention in the kit name. I was confused by the description "maintain the strand information". She explained that refers to making cDNA properly without any strand information. If you are not sure, you can process RNA-seq data using both stand options. Based on the results, it should be obvious which is the correct strand (if stranded, usually over 90% of the reads are on one strand). I did that too. Both ways it was >90%. @ piyushjo , in the embed text you pasted, there was an additional spammy link to a movie-related website that I removed just now. Please clean up embed links before you post them here. Usually, these image hosting providers add some stuff to redirect to their website and then additionally garnish it with some spam if we're not careful, and we need to remove this extraneous stuff before sharing. Sorry! I used the imagedb website. Your links are from imgbb, so I'm not sure what happened. Maybe the service you used uses imgbb and just adds spam on top? Which strand specific option need to be used with HISAT2?